The holiday season can be stressful for even people who are usually calm and collected. But coping with panic disorder along with a packed schedule and family expectations can make an already-taxing condition almost unbearable. The good news: effective techniques do exist that can help sufferers manage their panic attacks, allowing them to enjoy end-of-the-year cheer with all their loved ones. Organization plays a vital role in coping with panic disorder - especially around the holidays, as last-minute plans or shopping trips can easily trigger a panic attack. As the season approaches, plan ahead to know exactly how much time you'll need to accomplish everything. Also, don't be afraid to say "no" to events that you know will be stressful. Avoiding surprises and overexertion are great ways to minimize the risk of an episode. Many sufferers of this condition feel trapped in confined areas, so coping with panic disorder becomes more difficult in colder months. 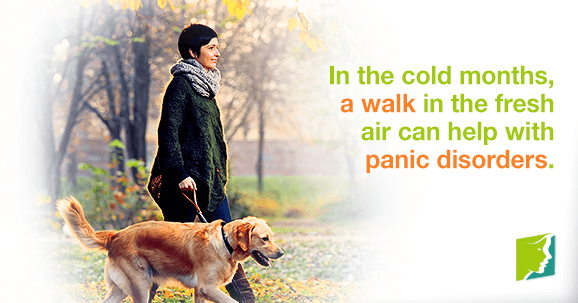 If this is the case, a brisk walk in the park might be just the thing to ease the mind: fresh air is a soothing scent for many, and regular exercise keeps the body in tip-top shape to minimize lifestyle-induced triggers. Bundle up for a quick jaunt with a friend on the weekend, or if it is too cold out, find a gym to hit up. Music is a highly influential stimulus, for better or for worse. Use it to your advantage when coping with panic disorder by finding a song that soothes your mind or evokes memories of better times. Sometimes, this is a holiday song that reminds you what the season is all about. At other times, a completely unrelated song is better suited to distract from surrounding stressors. Put it on your music player, and when stress becomes too much, excuse yourself to a private area to listen your way to tranquility. Coping with panic disorder requires a delicate balance of awareness of oncoming symptoms and distraction from thinking too much about them. However, if a panic attack does strike during the holidays, make sure to take note of the incident and change plans accordingly. Don't just plow through the season to please others - health comes first, and loved ones will understand. If every event of the holiday season just seems like a chore, the best way forward for coping with panic disorder might be to take everything one moment at a time. Your to-do list will seem a lot more bearable if you focus on checking one thing off at a time, instead of being overwhelmed by all of your responsibilities. Focusing on the present will also help you enjoy the holiday season more. During the holidays, when stress runs high, it's particularly important to find effective techniques for coping with panic disorder. By following the advice listed above and maintaining a healthy lifestyle, you can stay calm, cool, and collected throughout. And who knows? You might end up considering it the most wonderful time of the year.